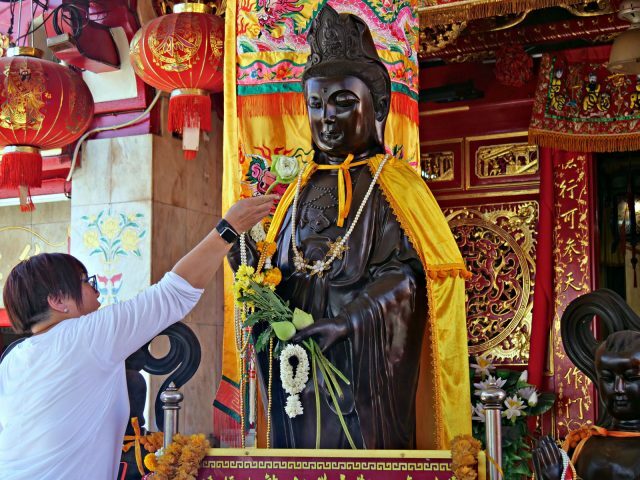 Phuket island is not just one beach, resort, massage parlor, bar and souvenir shop after another. 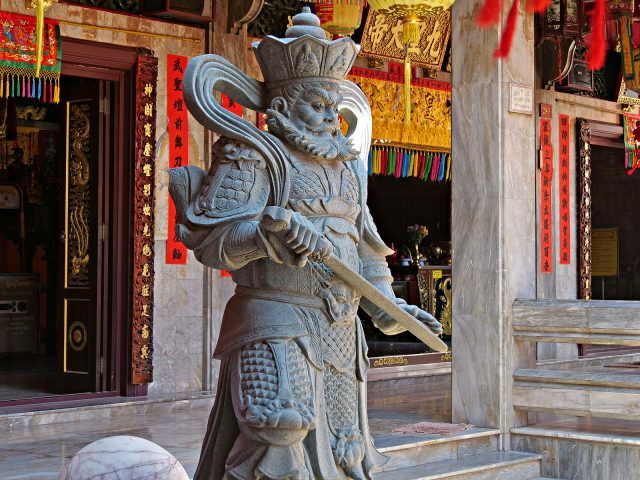 On its Eastern coast, there is a town with century-old Sino-Portuguese buildings, thriving markets, and a renowned food culture. 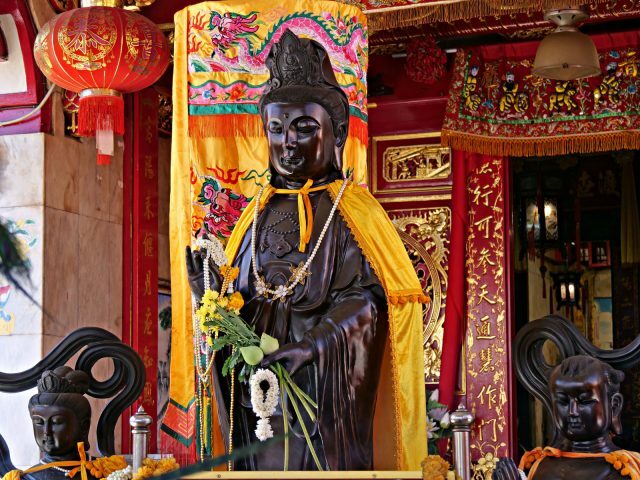 Today we will cross the island to Phuket Town for a food tour. 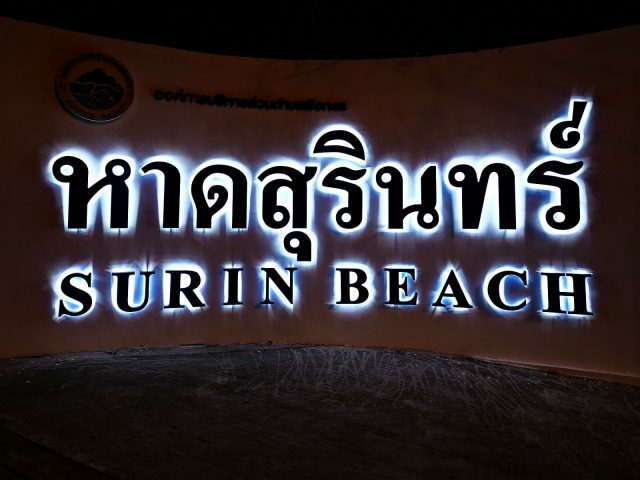 I was up early and decided to explore Surin Beach under cover of darkness. I wandered up the road several blocks to the Tesco-Lotus Express, a small convenience store, where I picked up a six-pack of the local club soda and a cold tea because I was already hot before 6:00am. I switched sides of the street and headed back toward the beach. Several dogs barked at me, and then followed me to where the dirt gave way to sand, after which they lost interest. 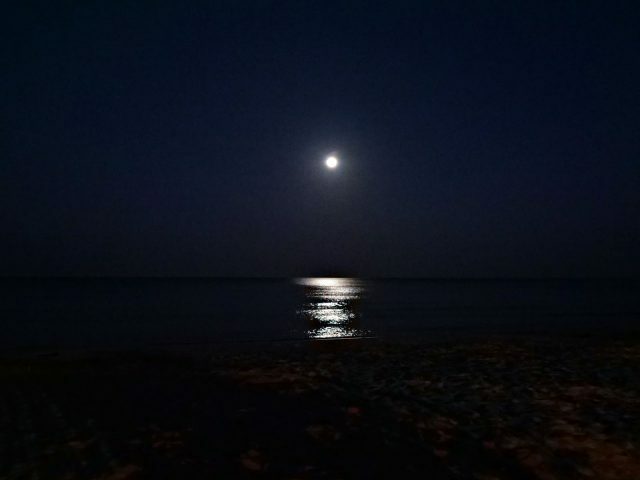 The moon shone on the sea, but the photos were not very interesting. 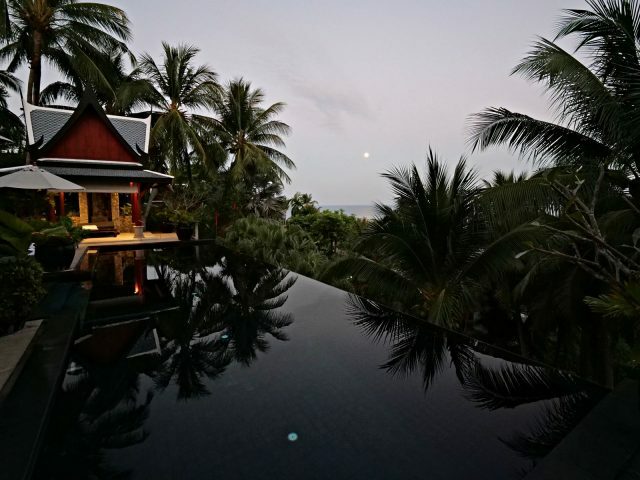 I was back at the villa by 6:30, by which time there was enough light to pick up reflections off the pool. Once everyone was up, we ate a large, delicious breakfast of eggs, bacon, fruit, and other dishes prepared by our house managers. Our van driver was a little confused by the phrase Phuket Central Market, thinking we wanted to go to the large Central shopping mall. 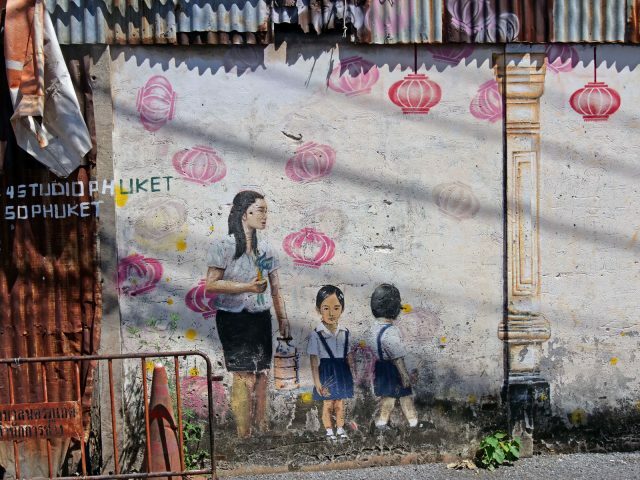 Eventually we were able to park within a few blocks of the market in Old Phuket Town, and meet up with our guide, Pema, from A Chef’s Tour. We started at the fresh market, where there was a convenient (if not especially clean) public restroom, and wandered several of the aisles learning about various ingredients. 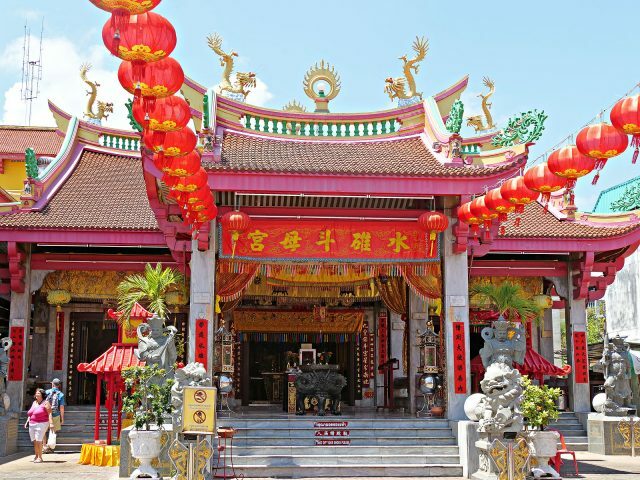 In 2015, UNESCO named Phuket Town a “Creative City of Gastronomy” based on its local fusion of ingredients and styles of preparation from multiple cultures. 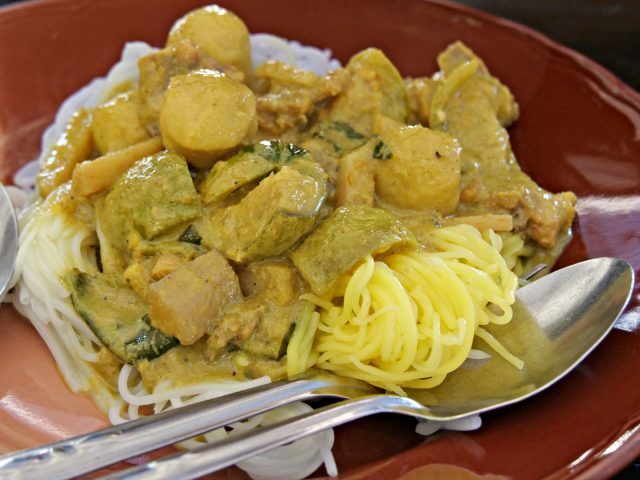 Particularly important is Baba cuisine, which combines aspects of Thai, Hokkien Chinese, and Malay cuisine, driven in part by fusion marriages of male Chinese laborers and Thai women. 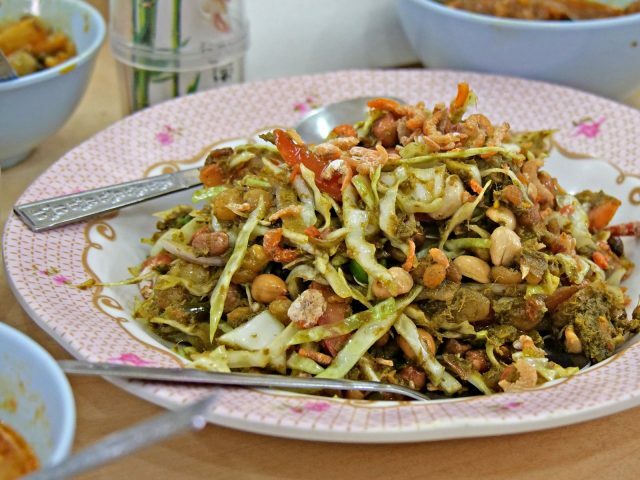 Over the years, Burmese, Indian and other influences have shaped the food of Phuket. And we were about to eat all of it. We wandered out of the market into an alley and headed for เมงกะราคอฟฟี่, whose sign says City Mart in small letters, and Mingalar Coffee more prominently. In the front, a man was flattening rounds of dough to about the size of a small plate, and then sticking them to a wall of a tandoor-style oven (a front-loader rather than a top-loader). 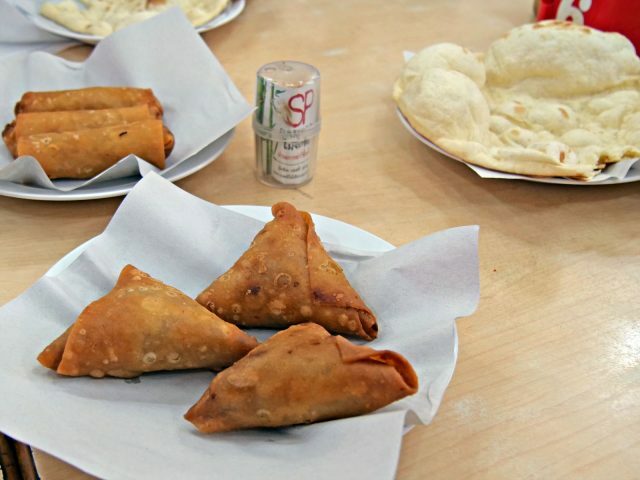 We would have an opportunity to sample this bread, plus samosas, spring rolls, two or more kinds of curry, a potato dish, soups, a Burmese tea leaf salad from a neighboring shop, and, and, wow, it was only 10:40am and we were getting full already. 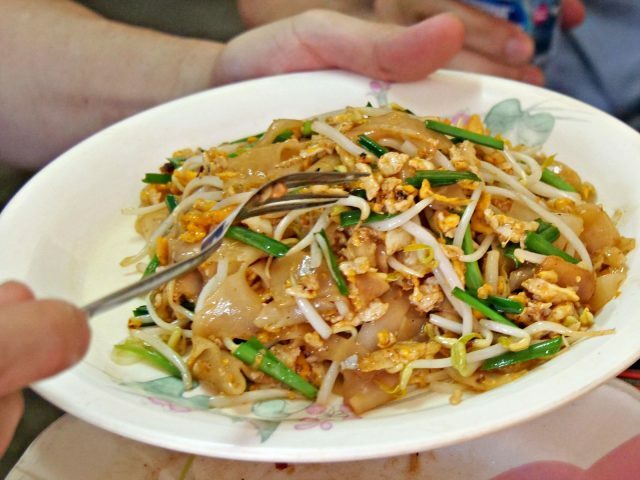 In a YouTube video, one of the men who helped convince UNESCO to designate Phuket a City of Gastronomy said “Phuket people have breakfast, late breakfast, lunch, afternoon lunch, dinner, late-dinner, we have all the meals.” Had we known we would be eating continuously for several hours, we would have skipped breakfast. Whoops. We got up to stretch our legs, and in less than two blocks, we had reached our next stop, two doors down from a nearby 7-11. 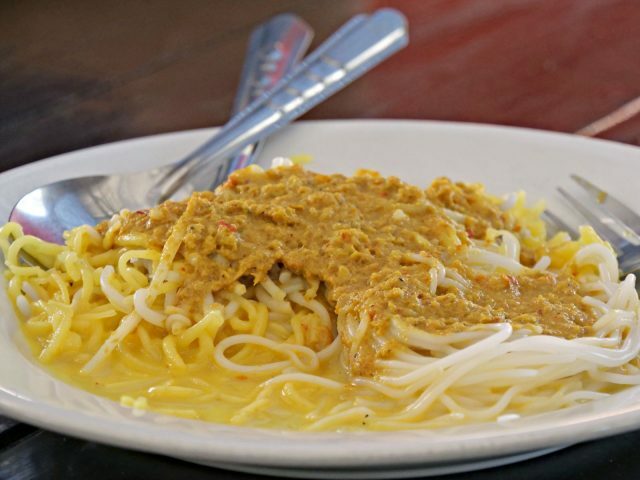 Pema told us this shop is renowned for its Hokkien noodles and Phuket-style Pad Thai. 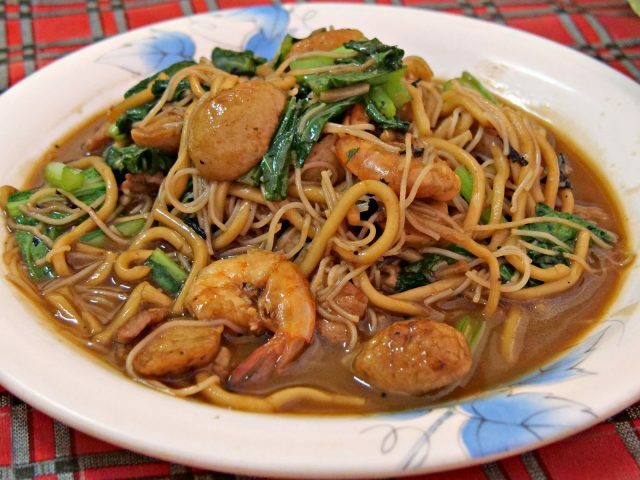 The Hokkien noodles combined both fat and thin wheat noodles (like lo mein and Hong Kong Style chow mein), seafood, Chinese broccoli and gravy. As we were not hungry, it was quite difficult to eat enough to show our appreciation. The cook seemed disappointed, but I think Pema was explaining that we just ate a huge meal. She probably would have to do that a lot today. 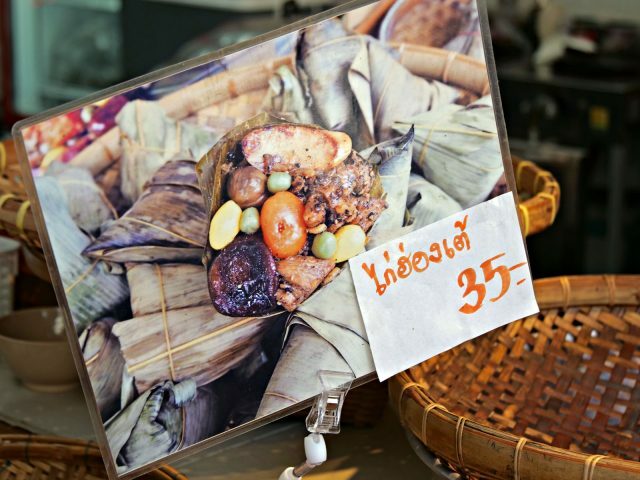 Around another corner, we stopped to try bak chang, a “dumpling” of seasoned glutinous rice with pork belly, shiitake mushrooms, braised chestnuts, gingko nuts, and salted egg yolk wrapped in a rather complex way in a bamboo leaf. 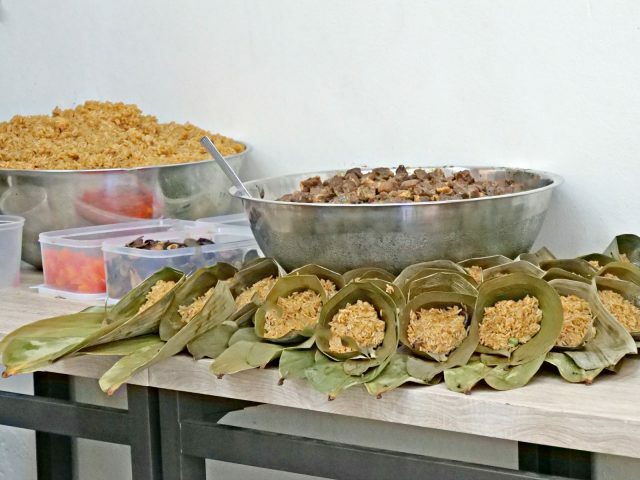 There is a legend relating these dumplings to the dragon boat festival, but the details elude me. We probably would need to enter a dragon boat race to burn this many calories. Yikes, it’s barely noon. But this shop had a nice bathroom, which was very welcome. Soon, it was time to eat again. 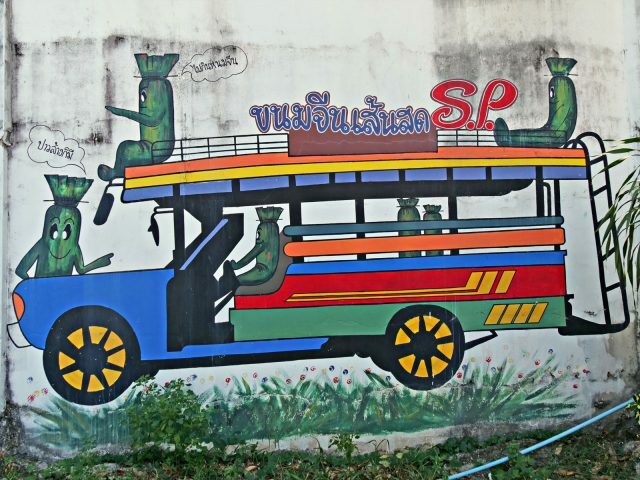 We stopped about two blocks down the street at ขนมจีนเส้นสด S.P., which appears, judging from the mural on the adjacent building, to be known for its sticky rice snacks wrapped in banana leaves. 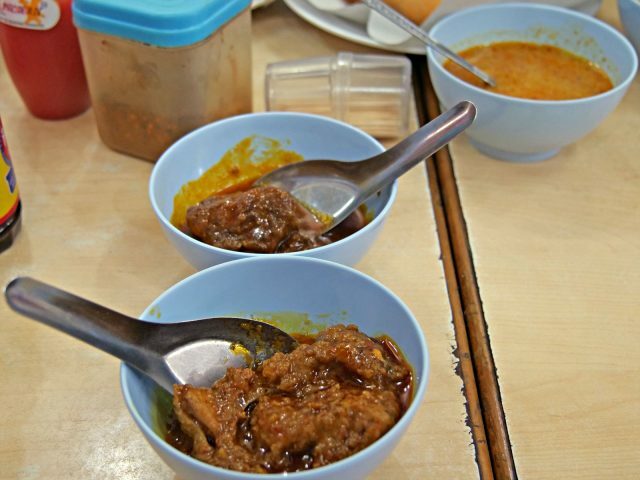 But before we even learned about those, we shared three plates of the popular one-dish meal, khanom jin. 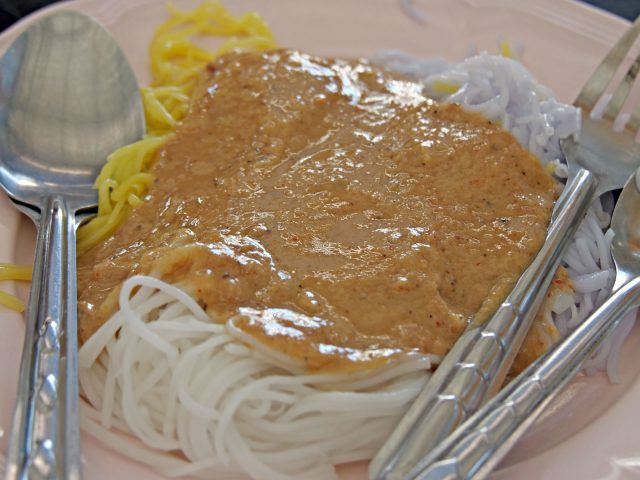 These are thin rice noodles topped with a ground fish curry, a green curry, a sweet peanut sauce, or other choices. Curiously, some of their noodles were colored yellow and purple, presumably with natural ingredients like turmeric and butterfly pea flower petals. 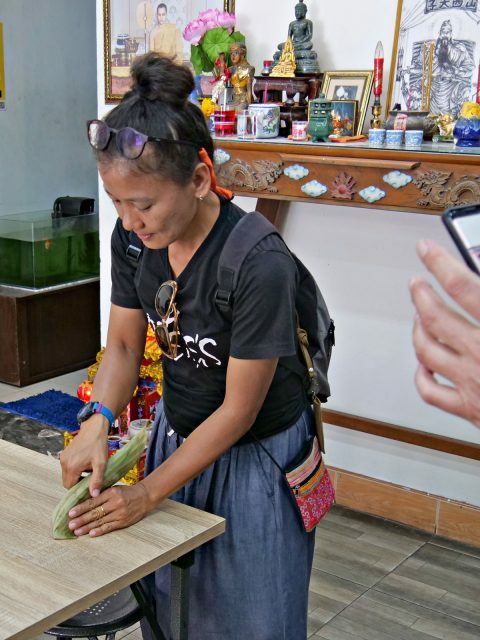 We took turns wrapping up bite-size bits of shallot and ginger with peanuts, toasted coconut shreds, and as many chillies as we liked with a sweet sauce in a wild pepper leaf (bai chaplu). 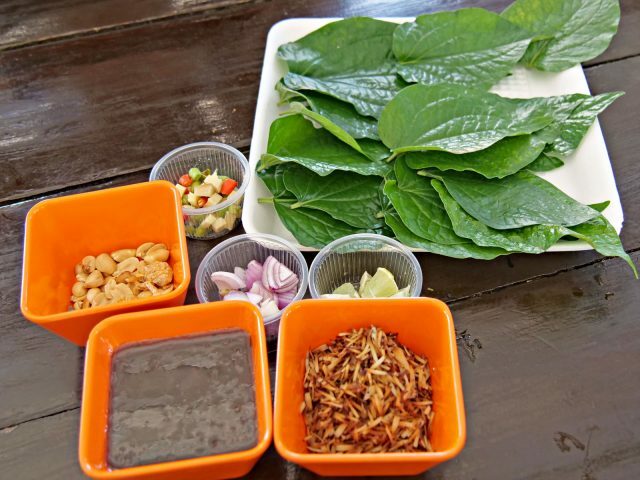 Similar to miang kum, but without the dried shrimp. 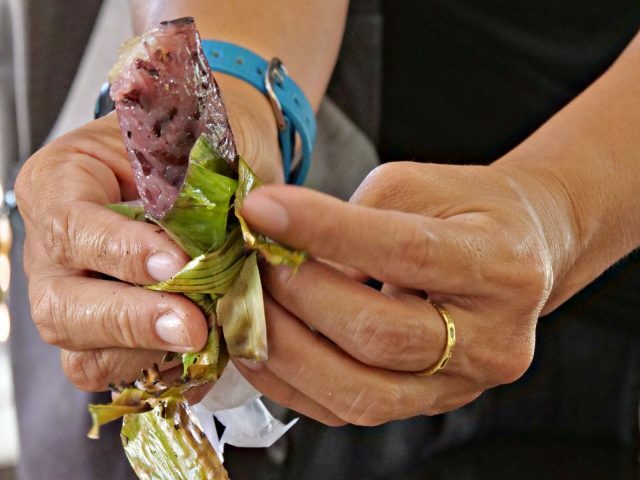 The sticky rice was white on one side and red on the other, although it seems that most of the red side was white rice that had been colored by a handful of purple rice. I can’t remember whether they were flavored with a sweetened coconut milk sauce, but that’s how I like them. 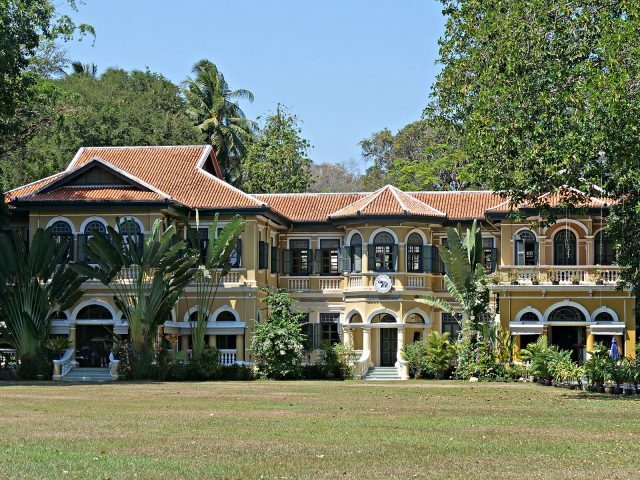 We took our time wandering through green spaces shaded by fruit trees, past a temple, to the Blue Elephant Cooking School & Restaurant, located in an historic governor’s mansion. We were here to admire the architecture and interior design, but there also were shopping opportunities, and a cold drink was very welcome. 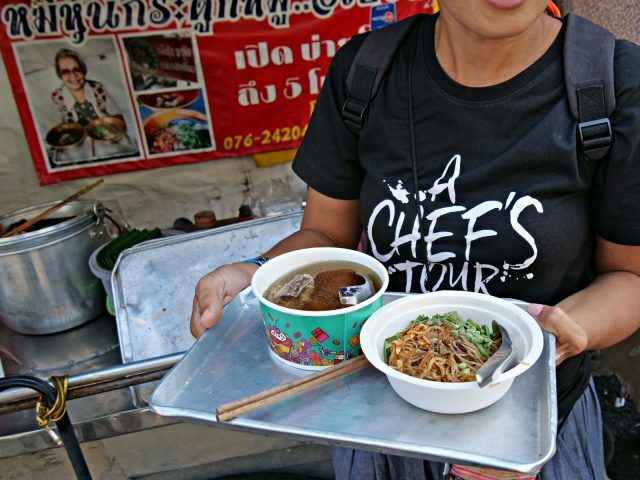 Just after 2:30, we ventured down a side street to a cart specializing in pork bone soup and fried noodles (probably อี๋เป๋ง หมี่หุ้นกระดูกหมู), which has been run by “Granny” since forever. We ate across the lane in what appeared to be an abandoned storefront with a limited amount of improvised seating. I was pretty out of it by that point; we probably were all in a “food coma.” After this meal, I stopped paying attention to where we were, or reaching into my pack for my camera. It was a level of fullness I seldom reach without passing out. But like a zombie who must feed, I continued to the next restaurant, the next shopping mall, the next grocery store, the next fabric shop. 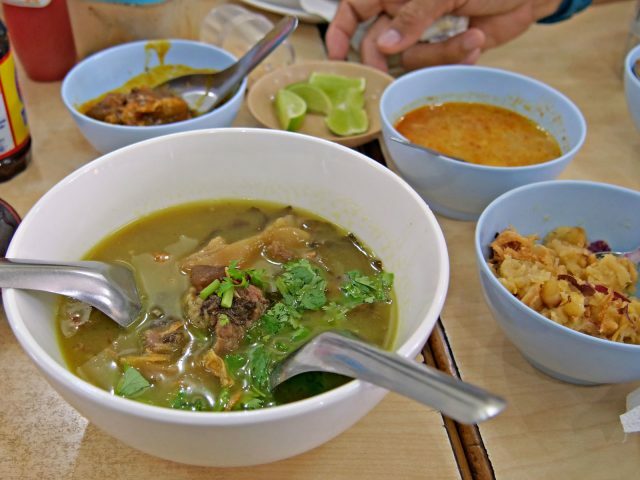 Our last stop, the Halal restaurant Aroon, is one of the oldest Muslim restaurants in Phuket. On the web, they are best known for their roti, but since we were seated by the kitchen, we were impressed by their fascinating way of pouring iced coffee that made it very foamy. Their soups were tasty, and we got an additional order of soup to go because we had given our staff the night off and we needed, maybe, to have food for dinner. Our final logistics involved Pema calling our van driver and directing him to various stops to make pickups, after which we headed for home, our four-hour tour having stretched to six hours, and our bellies having stretched, well, you get the idea. On the way back, we pulled over at Wine Connection, a chain of cafes with wine shops, where we could expand our horizons beyond the limited choices at 7-11. The oenophiles considered bottles from various unknown wineries and settled on three. Our timing was good: they can’t sell before 5:00pm and we were ringing up around 5:02. Back at the villa, we opened some wine and assumed a vegetative position on the couches around the TV. Episodes of the Netflix original series Dogs proved surprisingly moving, and I enjoyed a little stand-up comedy (to be clear, I was not the one standing). There may have been some light snacking on left-overs from last night’s dinner as we recovered from the day’s gluttony. Tomorrow we plan to take it a little easier, spending our morning at an elephant sanctuary, then doing a little shopping, having some relaxing massages, and enjoying one last home cooked dinner.